Yesterday, I took another tumble, falling over my own feet, staggering across the kitchen and falling into the boxes of plants that came two days ago. The boxes broke my fall, nevertheless, I hurt my back, right arm, the operative knee (again) and a few fingers. I banged my head on the plant stand by the sliding glass door and turned over a pot of pelargonium. I lay on the floor for a few minutes. However, the scent of crushed stems encouraged me to lift myself off the boxes and assess the damage to the begonia, coleus and other annuals. Many had broken stems and the coleus growth was crushed on several plants, but all will recover. Fortunately, I had already removed the heliotrope, helicrysum and verbena and had placed these plants on a top shelf of the plant stand. Today, all the plants go in pots in the garden. Johnny ran upstairs and scratched on David’s door rousing him to come downstairs, where he retrieved a chair pillow to place under my knee so I could get myself off the floor. Once again, I was grateful for the cow Mom kept when I was a kid (no broken bones), the wooden floor (no broken bones) and the loss of weight (I could get myself up). Mr. Potter knocked on my door yesterday. He says he can easily fix the rotten fence post. 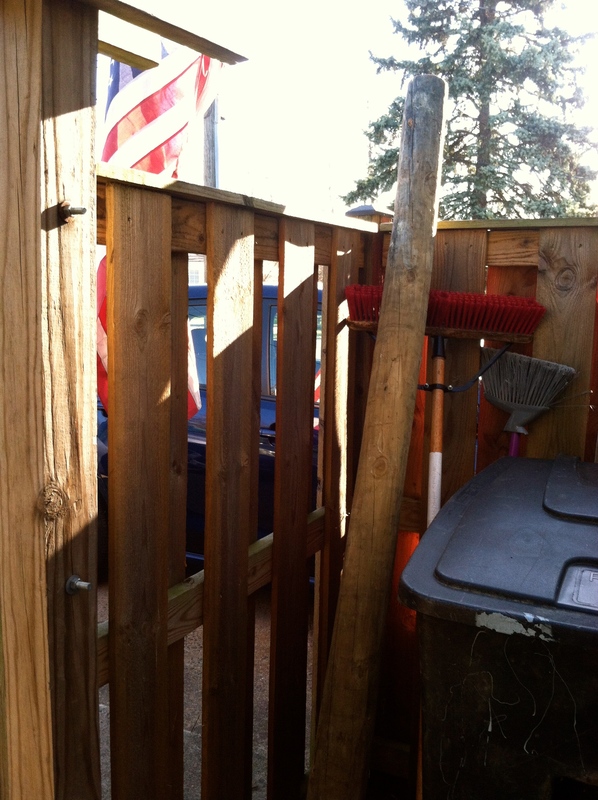 By evening he had the post with openings for fence slats parked in my yard. As it was draped over the fence and above an emerging peony I needed to stake, David moved it to the area where we keep the trash and recycle bins. That’s one less chore for John W., who promised to work on my garden shed next week. Otherwise, Mr Potter spent the day up at Kathy’s working on her back fence. When I walked the dogs yesterday, I made my way around the block . As I came back down the block, I met Debbie and Hank working in their yard. With all the fine weather now, folks have emerged from their winter hideouts, and are soaking up the sun. We all need our Vitamin D.
I was up early this morning, baking muffins for breakfast. I must inspire David for lawn mowing. How quickly it all comes back, the bees, the grass, the Robin watching me from a nearby shrub. He knows earthworms appear wherever, I walk. I read that earthworms, like crabgrass and dandelions are not North American natives. Experts suggest the seeds from the plants traveled in the cracks in leather shoes, but darned if I know how earthworms got here. In my spare time, will have to read Amy Stewart’s’ The Earth Moved: the Remarkable Achievements of Earthworms. Meanwhile David and I set up the Hummingbird Feeder. Michelle over at Nature Notes says they are on the move northward. I also have an Asclepius plant coming from White Flower farm to feed the Monarch butterflies. 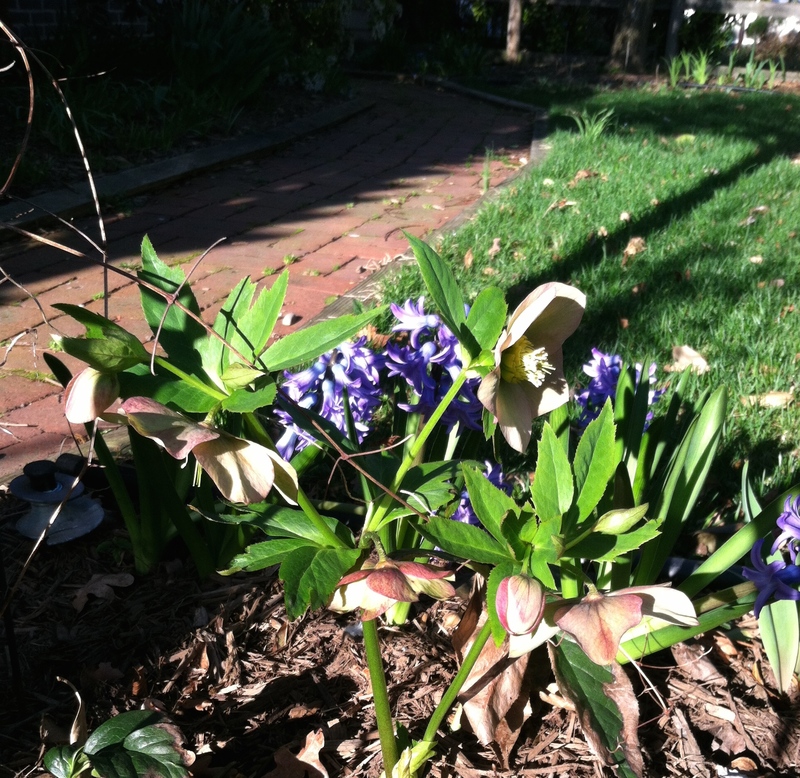 New Hellebore, old Hyacinths emerge from the mulch. This entry was posted in Books, Dogs, Environment and Nature, Friends and Neighbors, Gardening and Gardens, Health/Medical Stuff, Home/Home Improvement, Nature Notes, Retirement Living, Urban Living by SchmidleysScribblins. Bookmark the permalink. I’m sorry about your fall. I know how scary that can be and even when not seriously hurt very jarring. Lovely signs of spring. Oh wow, I am glad you were not hurt badly.. Love the pretty flowers. Take care and I hope you feel better. I am visiting from Michelle’s Nature Notes.. Have a happy day@! I’m black and blue and red all over. Falls are bad, but we don’t do it on purpose! You worried more about the plants you fell on than you did about yourself! That’s a sign of a true gardener I guess. Hope you (and the plants) recover fully. And be careful in there. One reason we enjoy Florida is the ability to get outside and see people pretty much all the time. (But my daughter says hibernation — and emerging from it — is necessary to her spirit!). You probably feel the same way — I wish you happy emerging and happy spring. You’re in Florida at the best time of the year. Spring happens everywhere, even Hawaii. Oh that fall sounds painful. I’m so relieved there were no injuries. Thanks. Bruises, but nothing serious. I hope you’ve fall-proofed your home as much as possible — grab bars, plenty of lighting, no throw rugs, etc. Anyway, glad those boxes broke your fall. Be careful! We have grab bars everywhere, but they are useless if you are in the middle of the room. Our hummingbirds never left, wintering here in our Italian cyprus. The lady next door prepares sugar solution for them, I have red flowers. They seem to thrive if they can stay out of the reach of the cats. Oh I envy you. Too cold in winter for the Hummers, but I love to visit my son when they are migrating south through San Diego. I wonder what kind stays with your Italian cypress? So sorry about your fall. Was that before or after your walk with the dogs? Sounds like the dogs & David all need you to be well ! I fell after the walk. Today we filled pots with soil and got those poor bruised plants outside. Ouch. I hope the soreness wears off soon. Oh I bounce pretty well. Worked outside all day and now I’m worn out. I worry about you falling. Yes, good that there was something to soften the fall, but still you fell. I’m forgetting to do my PT, and tho I am better from my last fall, I am not yet recovered. If you are still hurting, do stop in your docs. How did I know that I tore things. Feeling better. We worked outside for several hours. Hope you get well soon. Too bad about the fall. Lucky, no broken bones. My youngest sister tends to fall a lot, also. Sounds like spring is in the air for you. I’ve been falling over my own feet all my life. Comes from having misshaped feet and ankles from birth. Just happy I fell inside the house.